"It's a bit like a game show," said summit communications director Nick Nuttall. "It's going to be loads of Hollywood style announcements"
The international effort to fight climate change is about to get injected with a bit of Hollywood flash, a lot of Wall Street green and a considerable dose of cheerleading rather than dry treaty negotiations. 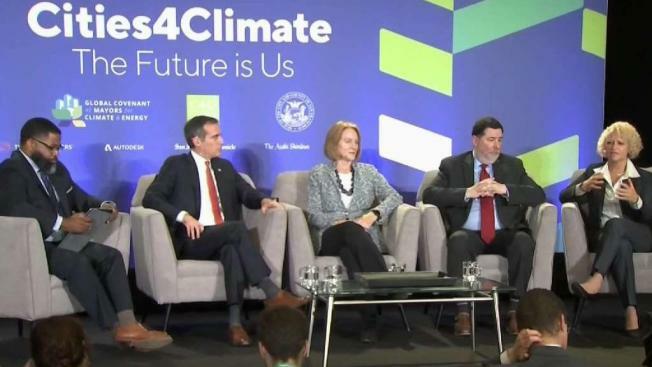 Business leaders, mayors, governors and activists from around the world gather this week in San Francisco for the Global Climate Action Summit, where participants will trumpet what they've done and announce new efforts to slow a warming world. 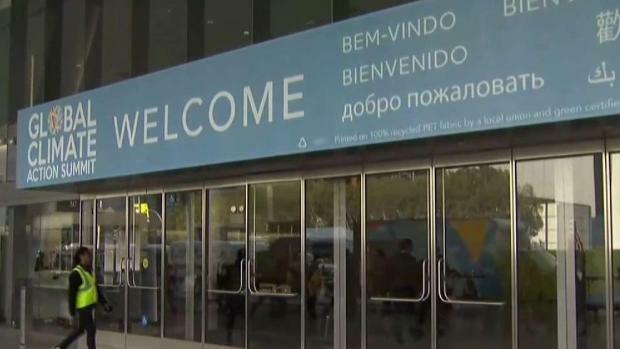 In addition, a smattering of celebrities such as musician Dave Matthews and actor Alec Baldwin will add a touch of red carpet feel to the summit, which starts Wednesday. It will involve trillions of dollars of pledges for spending on cleaner energy and getting out of investments in heat-trapping fossil fuels, according to officials involved. And it will include a newer way of fighting climate change by emphasizing more climate-friendly land use, food production and diets, along with massive increases in forests — something one expert called "the forgotten climate solution." Cities, states, businesses and charitable foundations are all going to get in the act. The international effort to fight climate change is about to get injected with a bit of Hollywood flash, a lot of Wall Street green and a considerable dose of cheerleading rather than dry treaty negotiations. Sam Brock reports. "It's a bit like a game show," said summit communications director Nick Nuttall. "It's going to be loads of Hollywood style announcements." And when you are talking about shifting trillions of dollars to finance initiatives, the private sector needs to get involved and that's happening, said Nigel Purvis, chief executive officer of the non-profit Climate Advisers and a former climate negotiator in the Bill Clinton and George W. Bush administrations. "This is the climate action summit, emphasis on the action," Purvis said. "Despite the lack of leadership from Washington, it's really about action." But so far such pledges have produced more talk than action, said Angel Hsu, an environment professor at Yale University and the National University of Singapore. She is the lead author of a United Nations report released Monday on what businesses, states and local governments can do and already have done. That report says businesses and lower levels of government have the potential to cut enough greenhouse gases emissions to keep global warming below the danger point of another 2 degrees Fahrenheit (nearly 1 degree Celsius) from now. However, the same report says so far, 8,000 pledges from those groups haven't accomplished much. To keep from hitting that 2 degree mark, the world has to cut its expected annual emissions by nearly 15 billion tons of carbon dioxide equivalent by 2030, including what's pledged in the 2015 Paris climate agreement. The businesses and states basically get about 4 percent there, according to Hsu. "It's not much," she said. "We were actually shocked to find that the numbers were so low." Hsu also looked at pledges made in 2002 in a South Africa conference and found that 65 percent of the pledges had no records showing they were acted upon. This week's summit aims to create momentum for 2020 when world leaders return to the bargaining table to pledge even deeper cuts of heat-trapping emissions than set out in 2015, said Christiana Figueres, the former top United Nations climate official. She proposed this summit right after the Paris agreement was signed. "This is sort of the real economy speaking for itself," Figueres said. She hopes the summit creates a "virtuous cycle" where businesses and states spur national governments to do better, which in turn spurs businesses again. Pete Ogden, a former Obama climate and national security official and now a vice president at the United Nations Foundation, said "if Paris is going to work it needs to have that positive feedback loop." Showing what people closer to the action can do and are doing to fight global warming will help global leaders pledge to do more when they gather in 2020, Ogden and Figueres said. Thousands of activists marched Saturday morning in San Francisco in what organizers call "the largest climate march the West Coast has ever seen" to demand action against climate change from elected officials. Christie Smith reports. The key for Canada is phasing out coal — the dirtiest fossil fuel — by 2030, said Canadian environment minister Catherine McKenna. "It's really important to showcase that the world is moving forward on climate action," McKenna said. "Everyone is acting on climate change not only because it is the right thing to do but also because there's a huge economic opportunity." As the market gets on board on with climate friendly actions, she said, that makes "the billions flow into trillions."